EVERYBODY has a favourite store when it comes to the regular grocery shop. Whether it's accessibility, variety, quality or pricing, there's always one supermarket that stands out among the rest. The hunt for a great bargain is often a priority (how excited do you get when you find your favourite brands on sale? ), so the NewsMail has pitched four major supermarkets against each other with 11 common household items to see who comes out on top as the cheapest store in Bundy. 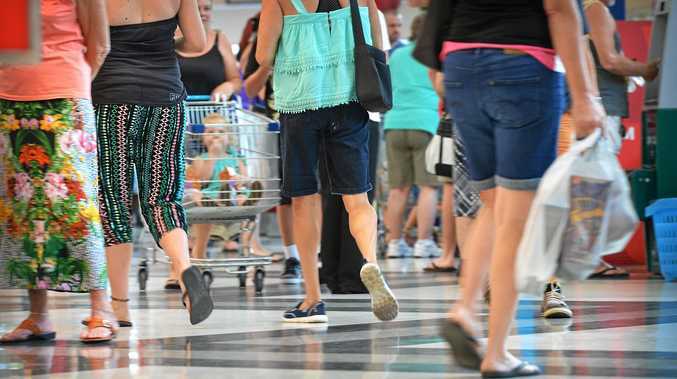 TOP SHOP: Four Bundy stores face off to see who charges the least for regular household items. The items selected range from common food and drinks to washing powder and, unsurprisingly, Aldi beat Coles, Woolworths and Everfresh - but there's a catch. Buying these items at each store would set you back by $55.04 at Coles, $59.23 at Woolworths, $43.36 at Aldi and $57.76 at Everfresh. At first glance the total shopping bill makes Aldi a clear winner, but some items on the list aren't available or are sold in lower quantities at the German discount supermarket giant. 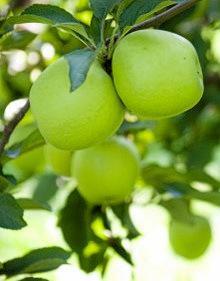 ON THE LIST: Aldi and Everfresh charge the same amount for 1kg of Granny Smith apples. Buying a 2L bottle of Coca-Cola at the other three chains would cost you at least $2.85, but Aldi only sells the popular soft drink in a 1.5L bottle, equating to the same as Coles and Woolworths when broken down to price per litre ($1.43). Similarly, the other stores charge $3.80 a kilogram for Fab washing powder whereas Aldi's Trimat powder, which comes in a smaller size, is priced at $3.79 a kilogram, making it only one cent per kilogram cheaper. The supermarket's uncooked roast chickens are significantly smaller than the other stores. 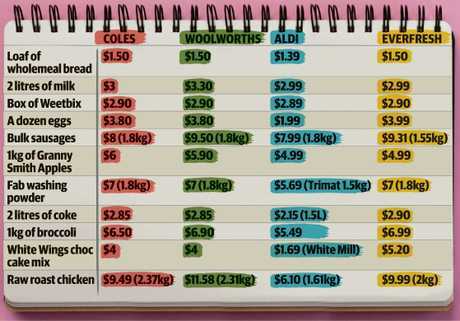 Per kilogram, Aldi's chicken does work out cheaper, followed by Coles, Everfresh and Woolworths, the most expensive choice. Similarly, Aldi does not sell White Wings chocolate cake mix but rather its own in-house brand, White Mill. Everfresh, which recently transitioned from being an IGA, had a unique system for pricing bulk sausages, basing the fee on weight rather than the number of the tray contains. 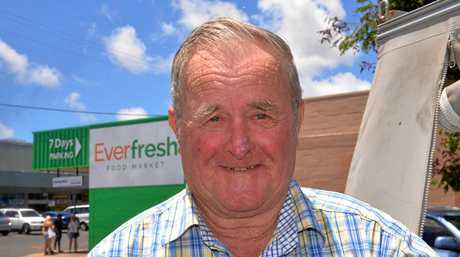 Bundy local Franklin Collin said Everfresh was his pick of the crop because it was simple for him to get to and had plenty of parking. "It's easy to get at, especially on a Saturday afternoon or a Sunday," he said. "You can park and go straight in." Mr Collin said his advice for bagging a good bargain was to look through the "junk mail" that many simply dismiss and throw away. "You can get the junk mail they send you, find out the specials and you go and get what you want to get," he said. Another consideration is that Aldi shopppers must bag their own groceries, whereas staff at the other three do that for customers.